1. Right-click on the link below and select "Save Target As"
2. Choose a location on your hard drive where you want to put it. 3. 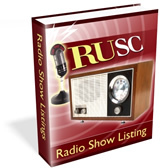 Once the download has completed go to the folder where you stored it and double click on the file named rusc-old-time-radio-show-listing.pdf. If you have any trouble downloading this ebook please do let me know at ned@rusc.com and I'll get straight onto it.